More news just in from Stefanie Glassman at dahm international as Jochen Brill sells his central listing, the 28.5m sailing yacht Bramante in an in-house deal. Bramante is a 28.50m classic sailing yacht, built in 1984 by Jongert with naval architecture by Willem De Vries Lentsch Jr. 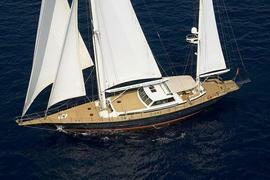 This Jongert 24DS model superyacht has undergone several refits, most recently in 2008. Bramante can accommodate up to eight guests in one master and two twin cabins, along with two Pullman berths, while a range of 3,500 nautical miles at 9 knots can be achieved via a single screw propulsion 420hp Mercedes MTU diesel engine. Bramante was asking €1.8 million and marks the seventh superyacht sale so far this year for dahm international.